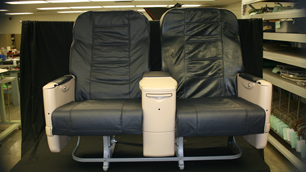 Soundair's seating department is designed to provide spare returns rather than full ship set repairs. This is an alternative solution for quick turn-around of one-off repairs that sometimes get lost in the shuffle of an entire fleet of seats. We can assist you with attaining a valuable return on your investment by repairing or overhauling the forgotten seat saving you long lead times on replacement equipment.